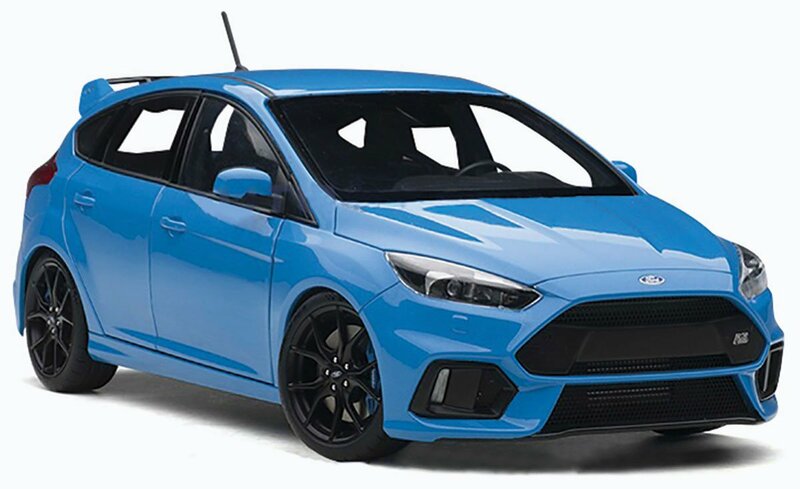 AUTOart will shortly be releasing its quartet of 1:18 replicas of the 2016 Ford Focus RS. Officially these are Nitrous Blue, Frozen White, Shadow Black and Stealth Grey. The 2016 Ford Focus RS took the engine from the 2.3 litre Ecoboost unit fitted in the Mustang. Not only that, but it received an upgrade to the turbo, bore liners, and Cosworth cylinder heads. This resulted in an extra 39 bhp, taking the total to 345 bhp. Those extra horses enabled a 0-62 mph time of 4.7 seconds, and a top speed of 165 mph. Another upgrade for the car was all-wheel drive, something that had not been available on the previous two Focus RS models. With a price tag of £29,995, the third-generation Focus RS received rave reviews when it was launched, with the general consensus that you received an awful lot of bang for your buck. These days AUTOart seems to be moving away from the ‘sealed bodyshell’ arena, and indeed its 1:18 Focus RS replica will come with the full gamut of opening parts. As usual with AUTOart, we have had to guesstimate the price as best we can, as the company never confirms the RRP of a replica until it is about to be released. You will then be charged the confirmed RRP when your 1:18 Focus RS is despatched, even if it is lower than we have said here. We promise that we won’t pocket the difference for ourselves!